Everyone’s favorite Merc with a Mouth continues hacking and wisecracking his way across the Marvel Universe in this second volume of riotous, ridiculous and outright reprehensible team-ups! First up, Deadpool goes to England where he squares off with Captain Britain over a fabled weapons haul. Then, what happens when the only person a demonic sorceress named Satana can find to help her is our lovable and slightly deranged Deadpool? Well, telling you would be telling, but if you listen real hard you might hear the distant chimes of...wedding bells!? Also, Mr. X has traveled near and far and faced some of the best fighters the world has to offer. But can anything prepare him for what happens when Deadpol is contracted to kill him? Then Deadpool’s destructive past catches up with him when he gets a call from the indestructible robot (and part-time insurance agent) Aaron Stack AKA Machine Man! All this plus GORILLA MAN! 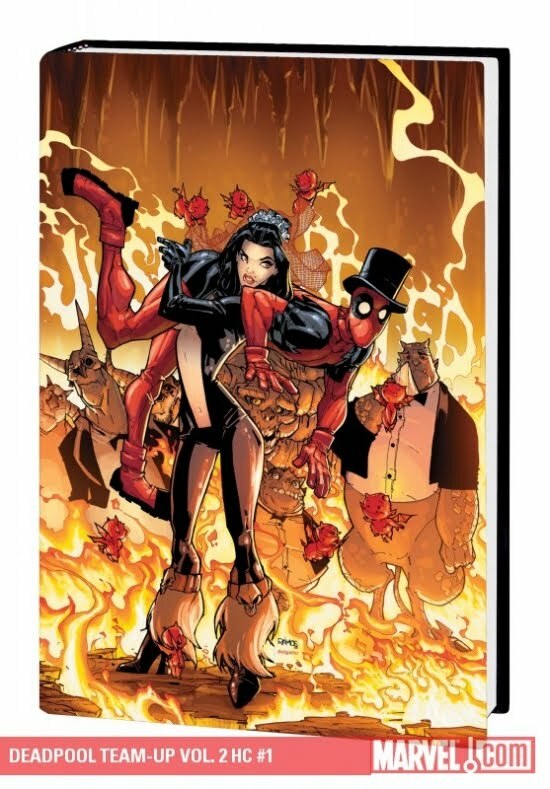 Collecting DEADPOOL TEAM-UP #893-889 and DEADPOOL CORPS: RANK AND FOUL.